One Lucky Day: Oh Canada! We're back...alive and well and back from Canada. Since our return we have been buried in getting ready for CHA and catalog work. Yes, it's the end of May...and Calgary gets snow! Our host in Calgary was Lori Wilson-Bunda from The Scrap Yard. 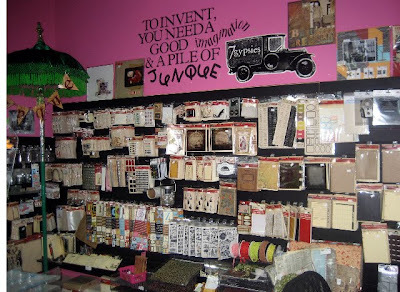 Her store is inspirational, here is just the 7gypsies section. They put the entire store on wheels so it is constantly changes for whatever their current need....gotta love anything on wheels! Speaking of Lori, she figured out some interesting uses for our metal page edges that we used in the class....she is a hoot!! ....and check out her boots...every well dressed girl should have a pair of rubber cowboy boots! ....they were rigged so that Paula and I each were given one of these fabulous bracelets that Lori hand made! To top off our fun day we were treated to some famous "Albert beef" with several of our new best friends. Thank you Lori and all of our new friends, we had a great time! Okay, this is a fabulous posting. It was fun for all of us too. Thanks for coming to the "chilly north". Great post, Love Love Lori's cowboy boots, how cute are they???? We loved meeting you girls! Hope to see you again!